It's not the greatest picture but I got all four of them nonetheless! Jenna was the big helper last Tuesday as we had a full house. 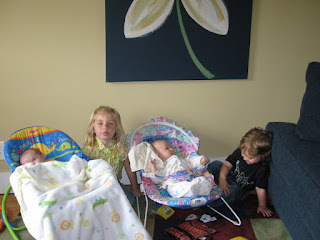 Jenna helped me babysit Oliver (19 months), Jonas (2 1/2 months) and Allee (4 weeks). It was tons of fun having them all over, the hardest part is 4 very little kids in a very small house! I occasionally had to protect Allee and Jonas a bit from Jenna and Olivers flying toys and games of tag but it was a fun filled morning. Jenna loves having kids over and so do I.